Daniel Moreno, Alberto Losada, and Leife Hoste have all been confirmed for Team Katusha in 2011; all three riders have signed two year deals with the Russian superteam. Daniel Moreno and Leif Hoste come to Katusha from Omega Pharma-Lotto, while Alberto Losada makes the jump from Caisse d'Epargne. Both Moreno (29) and Losada (28) have proven themselves as trusty mountain support men and will provide greatly needed support for the UCI #1 and two-times in the top 10 of a Grand Tour in 2010, Joaquim Rodriguez. A native of Madrid, Moreno also has shown his merit on his own after finishing 11th once and 12th twice in his homeland's Grand Tour, as well as threatening on a number of Grand Tour stages and one day races, including a 2nd at the Giro del Piemonte last year behind Philippe Gilbert and a 2nd at the Japan Cup behind Chris Anker Sorensen. In Losada, Katusha picks up a Catalonian in support of another Catalonian - Rodriguez, which can't be understated. Rodriguez has shown himself a rider that can profit from better support in 2011. His season has been of mythical proportions compared to years past. Rodriguez finished 8th overall in his first ever Tour de France in July, then followed that up with a valiant effort for overall honors at the Vuelta before eventually finishing 4th overall behind Nibali, Mosquera, and Velits - that's only the Grand Tours. Rodriguez has run rampant from the start of the season all the way through September. Katusha now looks to be adding the necessary firepower to get even more out of the Catalonian mountain man. On the other side of the cycling spectrum: the Classics. 33 year old Leif Hoste, a two-time podium finisher at the Tour of Flanders, will add an extra cylinder to the Katusha threat in the Spring Classics headlined by Filippo Pozzato. After two stellar years in 2006 and 2007, Hoste has been largely quiet the last three seasons. Hoste hasn't managed a podium at either Paris-Roubaix or the Tour of Flanders since 2007. Since his second consecutive runner-up finish at Flanders in 2007, the results at Flanders have dried up completely and been replaced by solid, if unspectacular, results at Paris-Roubaix: 6th in 2008, 4th in 2009, and then 8th in 2010. That's not to say that Hoste is washed up and finished just yet. If Hoste can get his career back on track in 2011, we could see a potent 1-2 in Pozzato and Hoste come April. It looks to be a wise investment for the Russian team and one that will certainly be appreciated by Pozzato. 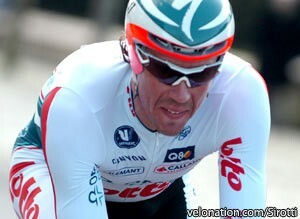 Katusha's gain will be a significant loss for Omega Pharma in 2011 though. Again, while Hoste has been largely quiet over the last number of years in the Classics, he was still an excellent teammate in support of Philippe Gilbert. Moreno also showed himself as a major helper for Jurgen Van Den Broeck at this year's Tour de France. Fortunately, Omega Pharma's acquisitions for next season will far surpass the two riders lost in the deal with Katusha.